bi-weekly newsletter for Pollitt & Co, a brokerage firm based in Toronto. In August 1996 an odd thing happened in Canada. For decades, federal government market debt(1) had been rising. From $24 billion in 1970, it had almost tripled to $70 billion in 1980, hitting $474 billion, about $16,000 per Canadian, in August 1996. That month, Finance minister Paul Martin started to break with this trend. 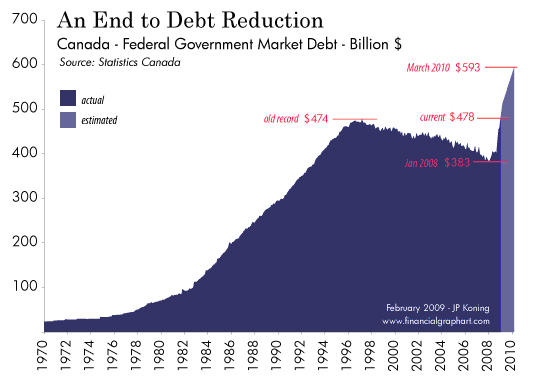 Debt stabilized and then began to fall, and by the time Martin exited the Finance department in 2002, Canada’s tab came in below $450 billion (see chart). Subsequent Finance ministers John Manley, Ralph Goodale, and Jim Flaherty chopped another $65 billion or so off the nation’s debts, and by early 2008 the total would hit its lowest level in years: $383 billion, or around $11,600 per Canadian. With the drop in debt came a corresponding drop in interest payments, freeing up tens of billions of dollars for tax cuts and spending. What made the Canadian debt reduction achievement so unique was the fact that the US had embarked on one of the biggest federal debt binges in history under a warlike George Bush. Big-spending governments in Japan and Europe increased their debt levels too over the same time frame. Canada was able to avoid the temptation to follow the bad habits of these bigger and more influential nations. Sadly, recent data shows that the Canadian experience with debt reduction is decisively over. What is startling is how quick things have been unwound. In just a few months the federal government has issued a whopping $90 billion or so in debt. The majority of it, about $75 billion, came between October 2008 and January 2009. Canada’s dues now clock in at around $478 billion, breaking the old record from 1996. What makes this so jarring is that just last January the federal government had achieved its lowest debt level since 1993. Where has the government’s $75 billion in cash gone? $50 billion of it was spent on the first batch of Canadian Mortgage Housing & Corporation (CMHC) mortgage backed securities (MBS) that Jim Flaherty promised to buy from Canada’s big banks. (2) Another $41 billion in cash is currently sitting in the government’s accounts at the Bank of Canada and various commercial banks, much of it earmarked for the next batch of MBS purchases promised by Flaherty. Originally advertised as worth $25 billion, the promised mortgage purchases were increased to $75 billion in December and to $125 billion in the 2009 Budget. Huge amounts of debt will have to be issued by the government to cover all this spending. At the same time, the recently announced federal budget is a whale of a budget, requiring even more debt to fund it. The fiscal year beginning in March 2009 promises a deficit (revenues less expenses) of $33.7 billion, and the one after that $29.8 billion. Combined with the effect of MBS purchases, these deficits are expected to propel total federal market debt to $512 billion by this March and to $593 billion in March 2010. (3) By 2011 Canada’s dues will be well into the $600 billion range. This is a massive increase of 60-70% in indebtedness in just a few years. As our chart shows, the 1996-2007 debt reduction now looks like nothing more than a sad aberration. "It’s not the job of the state to add to its traditional role of public service provider that of public hedge fund, nor should Flaherty start his morning scanning a Bloomberg terminal for securities he can buy low and sell high with taxpayer’s money." There are those that consider the federal government’s new debt as “good debt.” Minister Flaherty, for instance, likes to spin the $125 billion he will pay for MBS as a revenue making opportunity for Canadians. The government’s interest costs on government bonds, after all, are less than the interest it will probably earn from its MBS investment, so it stands to make a profit on the spread. Don’t be beguiled by his talk. If the big banks need $125 billion in cash that badly, why don’t they just sell their MBS in the open market? There is, after all, an active secondary market for CMHC MBS in which sovereign wealth funds, hedge funds, insurance companies, and pension funds participate. The answer is that the banks prefer to sell their MBS to the government because they’ll inevitably get better prices than if they were to sell on the market. Try dumping $125 billion in assets on any market and smart buyers will smell desperation and pull back, forcing that seller to drop prices. Having the government step in and buy saves the bank from having to pay such a penalty. If the government ends up paying $10 billion or so more than what the market would have born, that means the big banks are being subsided to the tune of $300 per Canadian. That’s a few hundred of their dollars that most Canadians will never realize has gone to the banks. It’s not the job of the state to add to its traditional role of public service provider that of public hedge fund, nor should Flaherty start his morning scanning a Bloomberg terminal for securities he can buy low and sell high with taxpayer’s money. It’s the job of individual Canadians and their advisers to decide on what makes a good speculation or market investment. Surely they won’t be so eager to pay the banks above market prices like Flaherty has done. Another reason some might call our new liabilities “good debt” is that the debt-funded purchases of MBS takes illiquid securities off the books of Canada’s big banks, providing them with cash which they might in turn lend out to credit-starved Canadian businesses and consumers. “It’s for the greater good,” goes the justification. Consider the hidden costs of this move. Going forward, Canada’s banks now have the incentive to add whatever sorts of illiquid debts they want to their balance sheet. After all, a government that has already spent $125 billion buying securities from bankers at above market prices will be able to twist the taxpayer’s arm to do it again in the future. This only promotes irresponsibility among bankers, weakens the Canadian banking system, and in the end serves as a hidden tax on all Canadians. What a shame to see our debt explode higher after years of steady cuts, and to have these funds spent on investments that provide no verifiable net benefit, and indeed impose hidden costs on individuals and the overall banking system. Canada’s failed effort at reducing federal government spending only shows that governments cannot be trusted to reduce their own size. In times of crisis, they will inevitably seize the chance to grow ever larger again. 1. Market debt is measured as Canadian Savings Bonds, government treasury bills and government bonds, and accounts for the lion’s share of total federal debt. 2. See "Government of Canada Responds to Global Financial Turmoil With Support for Canadian Credit Markets," Department of Finance, Canada, 2008-10-10. 3. See Table A4.4 of the 2009 Federal Budget in "Annex 4: Debt Managment Strategy 2009–2010," Department of Finance, Canada, 2009-01-27. * Cet article est aussi disponible en version française.